Photos: Koman Ilel, Daniel (Piratas for TM), Patxi, Valk and R.Rahal. 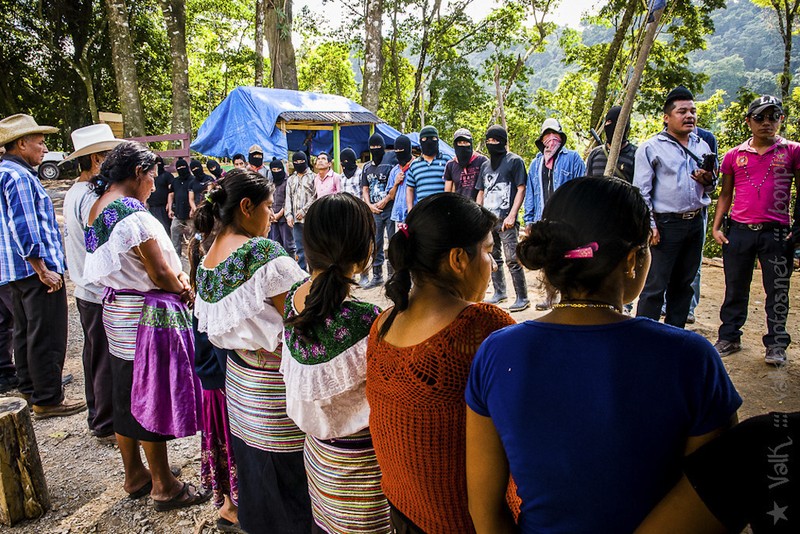 Following the violent eviction on 9th January last, when state forces dispossessed the camp set up on the recuperated land of the ejido (on 21st December 21, 2014), the ejidatarios of San Sebastián Bachajón -adherents to the Sixth Declaration of the Lacandon Jungle- together with independent ejidatarios established a new regional headquarters; located in a part of the territory which was taken from them in 2011, in order to develop tourist mega projects. On 9th February, at the end of the work of the brigade and one month since the eviction, it was reported that the ejidatarios affiliated to the Institutional Revolutionary Party (PRI) in the same municipality announced that if no action was taken within ten days by the police, they themselves would undertake the eviction; the deadline expired on Tuesday 10th February. 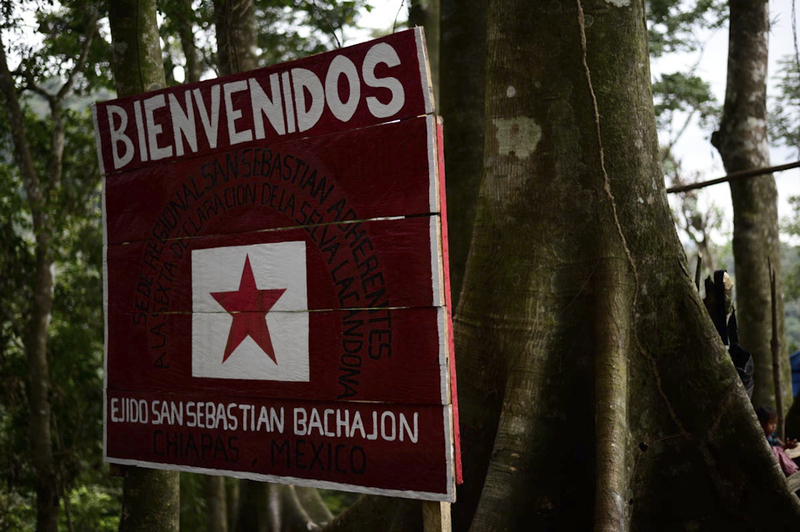 As they were targeting them again with the threat of another violent eviction, on 6th, 7th and 8th February, a national and international observation brigade in solidarity with San Sebastián Bachajón convened by the Network Against Repression and for Solidarity (RvsR) was undertaken. The participants were thirty-three people belonging to different groups and organizations from Mexico, Italy, France, Spain and Argentina and from the free (autonomous, alternative or whatever they’re called) media. Night was falling when the brigade was received in the new regional headquarters. 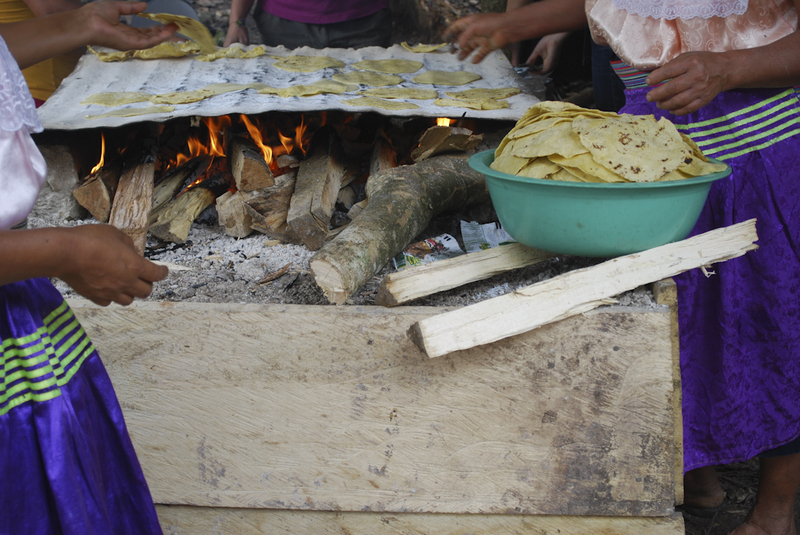 Lighted by torches and bonfires, a double row of compañeros and compañeras from the ejido offered a few words and some dinner to the newly arrived members of the brigade. It was not until the next morning that a formal start was made to the work of the committees. In a first sharing a historical account was given from the official establishment of the ejido, in 1980, when the files that defined the communal lands and property which was granted were received. It was in 2004 when the National Commission of Natural Protected Areas (CONANP) changed the boundaries of the ejido lands arbitrarily. 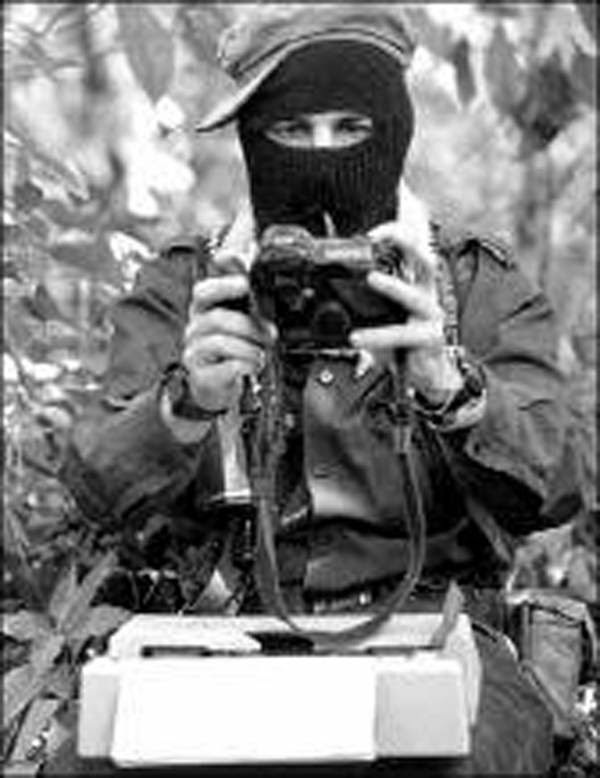 In this way began the process of struggle that led to the adherence of much of the ejido to the Sixth Declaration of the Lacandon Jungle, during the other campaign, which also began as a result of repression by the state. In 2009, the first eight ejidatarios were imprisoned; in 2011 the eviction of the toll booth at Agua Azul, which was administered by the ejido was carried out. At that time 117 people were detained, who reported having been tortured and beaten after having experienced a violent eviction, they were gradually released in an operation of punishment and bullying. The work of the brigade included the documentation of the problems and sharing the everyday work of the men, women and children in the community to learn deeply how their lives have been affected by the theft, violence and aggression. To do this various committees were formed, whose aim was to accompany the different tasks of the compañeros of San Sebastián Bachajón, such as security and the kitchen. On Saturday 7th February, a committee from “El otro Valle de Chalko” came to the community and created a mural on one of the fences of the headquarters in a show of solidarity and support. The work of the brigade continued until Sunday 8th in a farewell ceremony. 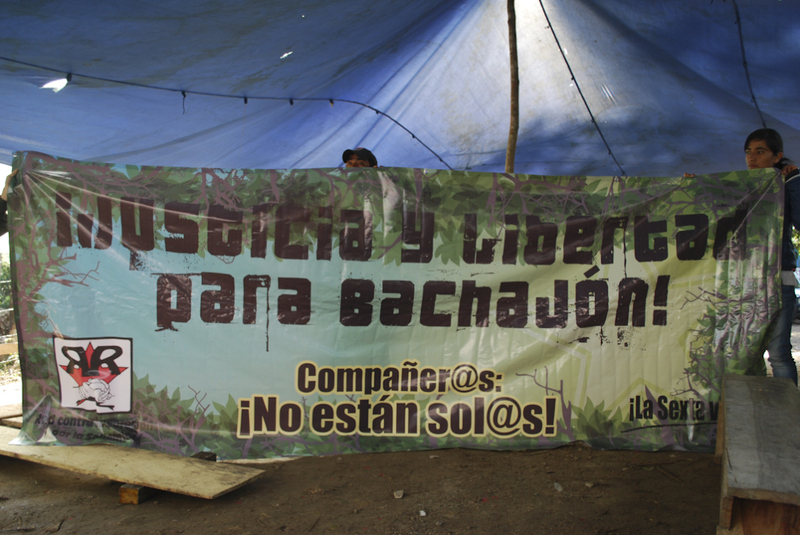 The RvsR gave a banner to show support and representatives of Bachajón spoke words of thanks to the members of the brigade, reiterating the need for solidarity and support in this continuing struggle. The State and the “officialist” ejidatarios (affiliated with the PRI) try to exercise terror towards the dignified inhabitants of San Sebastián Bachajón to put an end to their struggle. 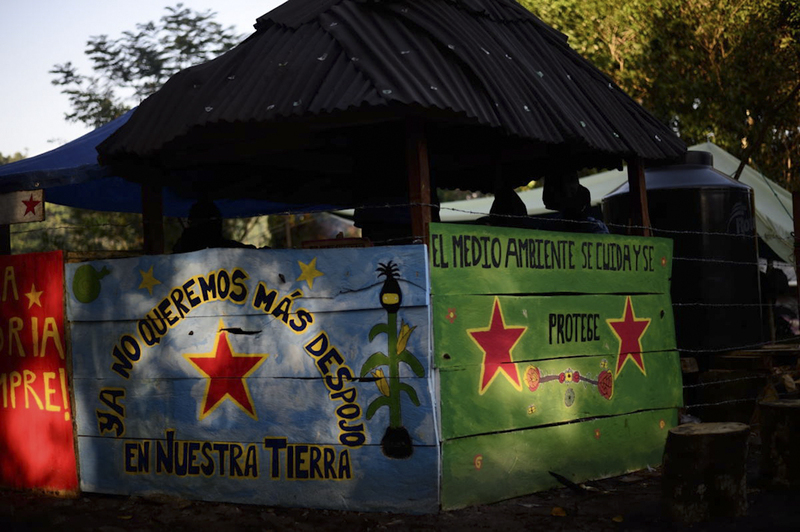 At a meeting of the brigade with relatives of the political prisoners and the assassinated the word was clear: the fight to defend our Mother Earth will continue. In this brief but powerful encounter, relatives of Juan Vázquez Guzmán and Juan Carlos Gómez Silvano, killed in 2013 and 2014 respectively, shared their stories and pain. They alleged that Juan Antonio Gómez Silvano was accused of murdering his brother and was serving a sentence on a charge of attempted murder. Also present were relatives of Emilio Jiménez Gómez, accused of robbery with violence of a foreign tourist who at the time of the confrontation did not recognize Emilio as the attacker but despite this, he was forced to sign a statement that he was not allowed to read. Esteban Gómez Jiménez, prisoner in el Amate, is charged with murder, robbery, possession of weapons and organized crime. Santiago Moreno Perez has spent five years in prison for manslaughter. Mario Aguilar (along with Juan Antonio Gómez Silvano) was arrested at Virgen de Dolores and in the same way was accused on charge of attempted murder, both were threatened and tortured by the police. It should be noted that governmental strategies for the imprisonment and murder of those who make them uncomfortable are woven together between authorities and companies. The tourism and transport industries seek to acquire land and build megaprojects that only exploit the land and its native inhabitants. The offences are alleged initially by companies and later, despite not being ratified, are used to prosecute and imprison.